Welcome to our first Christmas Contest of December!! 1. One entry per person~pick your favorite! 2. 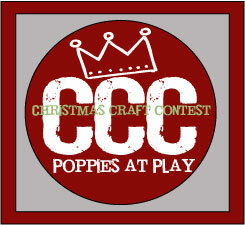 Your entry must include a handmade Christmas sign or handmade Christmas wreath! 3. Link back to Poppies at Play and tell people to voice their opinion! Winner will be announced Monday morning and will receive their choice of vinyl from The Market. They will also be crowned king or queen of cool wreaths or signs. Thanks for hosting a super cool party! Does it have to be a hanging wreath or could it also be for Advent? I love number 21, love that it is bright and cheery! Wow, I totally vote for #12. But I love #4 too. I'm not a wreath person, but those two are gorgeous! I love #22, so fun and different! Very creative. #22 is my favorite - great for Christmas, but could stay up all year long! My first time entering a contest like this (#37).. thanks for hosting! I give my vote to #33 - what a fun way to combine all those ornaments you hang on to over the years...This would be a fun wreath for my children's doors too. # 22 has my vote. It's time to get Christ back in Christmas and keep him there.